Marketing is a very important component to apps making money and often overlooked. There are over a billion apps of the various app stores. You are competing with all of the other Apps for attention and even if you have the best app it will not rise to the top if it isn’t easy to find. Making an App that is different from your competitors is very important. People think in terms of categories, for example “best ruler App”. If someone wants to measure something really long perhaps your App does that the best. Once you find what your App does best you can position yourself in the market; specifically in our example as “the best ruler App for measuring really long distances”. You also want to make sure your App is easy to find if someone is searching for you with that idea in their mind. You should pay particular attention to what you name your app and what keywords you put in your description. Determining the positioning of your App should be a key component of your strategy. What users see when they look at the App store is either what you see directly below or a slight variation on this. Unique – Your icon should stand out from other Apps in your category. Attractive – Your App icon needs to be attractive to draw users to your App. Convey Important Information – This is probably one of the most overlooked things about an App icon. Many App developers will handle one or both of the items above correctly but then pick something which doesn’t convey any real information about the App. Think about Apps like Angry Birds its very clear from the icon that the App is about a bird that looks angry. If you know nothing about the App you know that. You want to convey information in the icon which tells the user what it is. The same holds true for the title: when choosing a title only part of your title is shown to the user so pick the words which covey the most information in that short space. 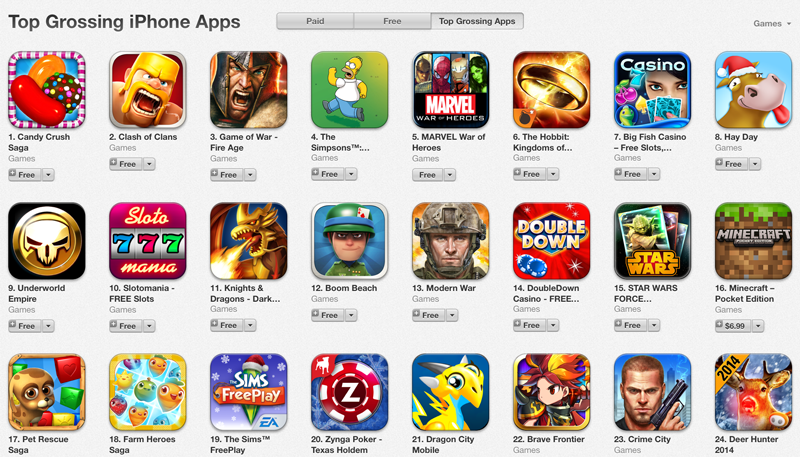 96% of the top grossing Apps on the App store use In-App purchase and aren’t straight paid Apps. Start by giving the user a free experience and keep them wanting more. I have written a full blog post HERE with full details on how to execute this strategy. Analytics let you know what users are doing in your app. Adding Google Analytics or similar tracking technology to your App allows you to determine where people are getting stuck and what might prevent them from enjoying your app. When Amazon built their website they did tests to determine what stopped people from buying. They analyzed where buyers would get stuck and over time optimized the site to allow users to buy as easily and quickly as possible without barriers. Look at your own analytics for your in-app purchase and if there are multiple opportunities to buy which one works better? Perhaps something as small as the text presented to the user prior to the buying process is effecting whether or not users buy. You can test by putting three different versions of the text into the app and then randomly displaying one of the three messages. Overtime by doing tests like these you can determine which of the three options makes people buy more. App Quality is very important to users. An App needs to be quick, attractive and designed with user experience in mind. Building a native app helps with some of this though even an attractive native app can fail to gain users if it isn’t designed well. If users can’t find the features they want or don’t understand how to use them then those features might as well not exist. Paying a designer to design your app may lead to more five star reviews as small design tweaks can really make a big difference. Even changing the looks of certain graphics or the positioning of a button can help users understand and better appreciate your app. We recommend not only building the app natively but getting a professional designer to help with designing the app and the app experience.